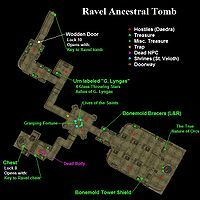 Ravel Ancestral Tomb is a large, Daedra-occupied tomb north of the Shrine of Azura and southwest of the Holamayan Monastery. You can find four shrines of St. Veloth here. 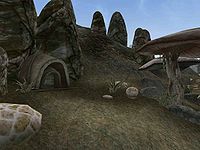 There are nine Daedra making this tomb their home. The loot is good: a couple of potions, some minor equipment along with some books (The True Nature of Orcs, Grasping Fortune and Lives of the Saints), the Ashes of G. Lyngas, four glass throwing stars, a few ingredients, two keys (to a door and to a chest that you can't open otherwise), as well as a journeyman grade probe and repair hammer. This page was last modified on 9 September 2015, at 22:05.